Celebrate Christmas and bring in the New Year in style on this fantastic 16-night festive luxury coach tour. 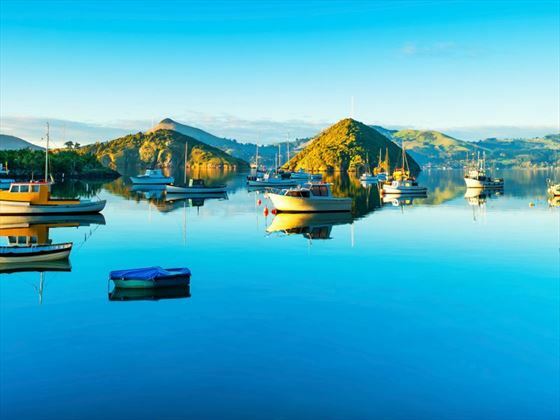 Starting in Christchurch and ending in Auckland, you’ll have plenty of opportunity to discover all the natural beauty, culture, and delicious food New Zealand has to offer. 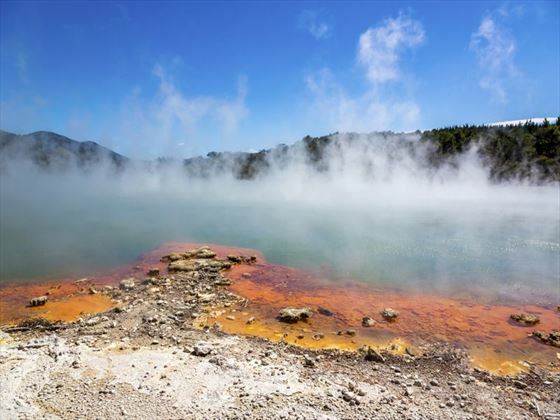 With four scenic cruises, a trip to Rotorua’s geological wonders, a rail trip on the TranzAlpine and a gondola ride on the cards, you’ll have plenty of pinch me moments on this epic trip. Better yet, you’ll certainly feel well rested as you relax on your luxury coach, reclining in your chair and watching the beautiful sceneries in your panoramic window. Your travel companions will soon become new-found friends, celebrating the festive holidays amidst some of New Zealand’s most spectacular landscapes (GP). Arrive in Christchurch and meet your representative, who will transfer you to your hotel. In the evening, you’ll have the chance to meet your fellow travellers. Hotel: Quality Hotel Elms - Dinner included. 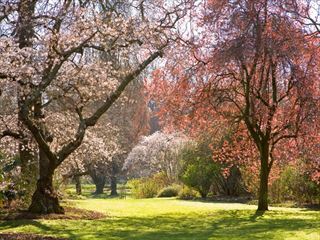 The day is free for you to explore Christchurch at your own pace. We’d recommend trying out one of the city’s leading attractions: the Christchurch Tram. Hotel: Quality Hotel Elms - Breakfast and dinner included. 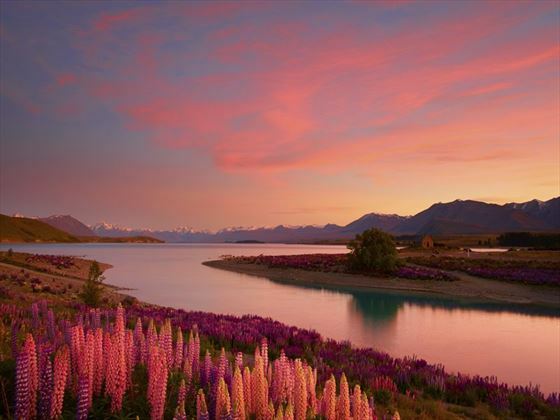 After a city sightseeing tour in the morning, you will journey through the pretty Canterbury Plains to Lake Tekapo. 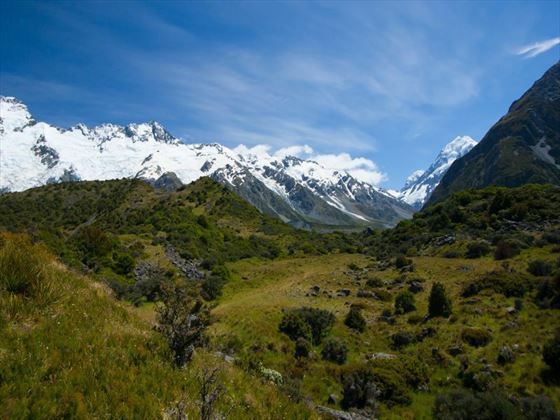 Here you can marvel at the azure water, visit the Church of the Good Shepherd, and view the Sheep Dog Statue, all the while taking in views of New Zealand’s highest peak – Mt Cook. There is the opportunity to enjoy a scenic flight over the Southern Alps too (optional and weather permitting). Hotel: Heritage Gateway Hotel - Breakfast and dinner included. This morning will be a scenic one, visiting Lake Benmore, following the Waitaki River, and marvelling at Oamaru - which is famous for its limestone. Once you’ve arrived in Dunedin, you will embark on a city sightseeing tour, before enjoying a bit of free time. The evening will be spent enjoying a traditional Scottish evening, with bagpipes, a special Haggis ceremony and a gift. Hotel: Mercure Leisure Lodge - Breakfast and dinner included. Delve into New Zealand’s history today with a trip to Larnarch Castle, where you’ll be taken on a guided tour full of scandalous stories. Afterwards, you’ll have time to wander around the Garden of International Significance, finishing the visit with a delicious Devonshire Tea. Soon you’ll leave Dunedin and travel to Te Anau, the gateway to Fiordland, where you can embark on a fascinating visit to the Te Anau Glow Worm Caves (optional). Hotel: Distinction Luxmore Hotel - Breakfast and dinner included. 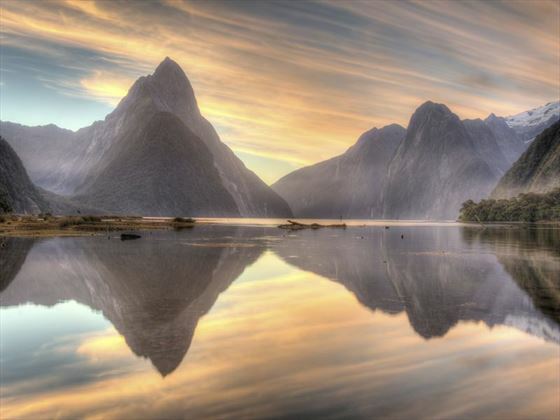 Today you will take a spectacular cruise along the magnificent Milford Sound fiord, gazing at the cascading Bowen Falls and soaring Mitre Peak as you tuck in to a picnic lunch. After the cruise, you will travel to Queenstown. 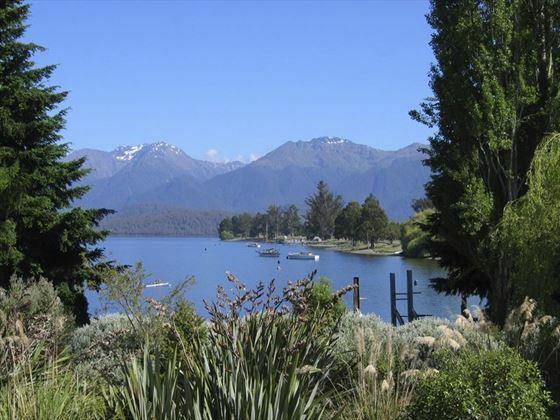 Hotel: Mercure Queenstown Resort - Breakfast, lunch and dinner included. Merry Christmas! Today you will celebrate in style with a cruise on the vintage steamship TSS Earnslaw across Lake Wakatipu to Walter Peak Station. Your usual Christmas roast will be swapped with sumptuous New Zealand high country cuisine in the Colonel’s Homestead, and on the return cruise to Queenstown you’ll get to sing along by the piano with your new-found friends. The evening is free. 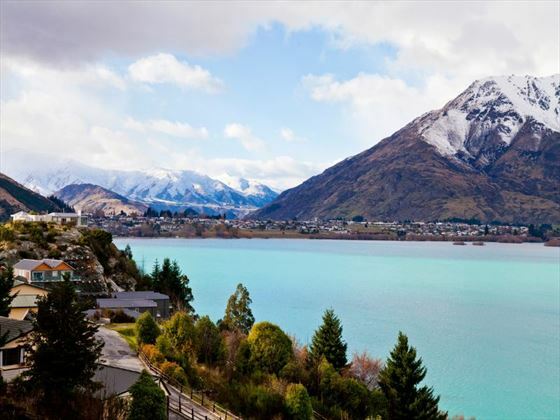 Hotel: Mercure Queenstown Resort - Breakfast and lunch included. 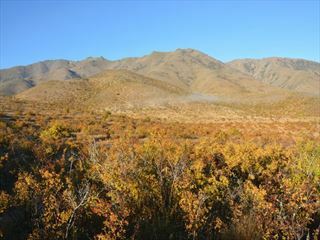 Begin the day with a trip to the Lakes District Museum in Arrowtown. 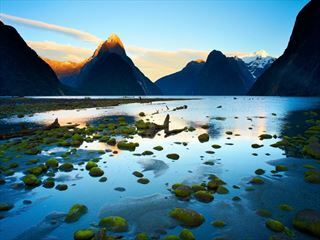 You’ll then venture via the Haast Pass to the stunning West Coast, gawking at the views of the snow-capped Southern Alps that will whizz past your winder. Once at Fox Glacier, you’ll have the chance to enjoy a scenic flight over the rugged landscapes (optional, and weather permitting). Hotel: Heartland Hotel Glacier Country - Breakfast and dinner included. After visiting the Greenstone Factory in Hokitika, you’ll follow the ascending road to Arthur’s Pass to hop onboard the TranzAlpine train – one of the world’s best rail journeys. Travelling past massive viaducts, sweeping river valleys and impressive gorges, you’ll soon reach Christchurch. 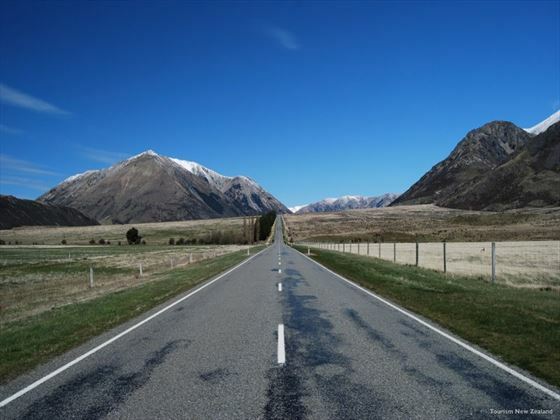 Today you will journey through the Lewis Pass on your way to the Marlborough Country, well-known for its decadent food and wine. 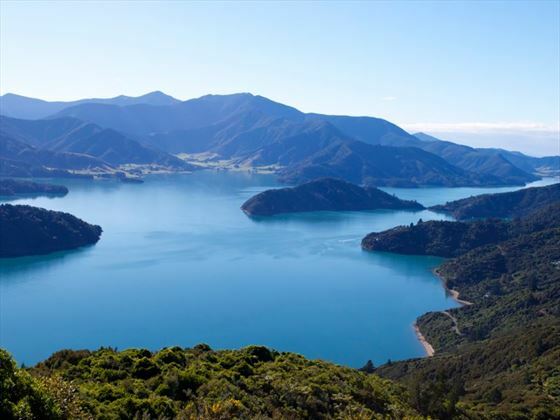 Then continue to Picton for your Interislander Ferry through the Marlborough Sounds and across the Cook Strait to Wellington. Hotel: Ibis Wellington - Breakfast and dinner included. Begin with an exploration of Gallipoli: A Scale of War exhibition taking place at Te Papa, New Zealand’s National Museum. The exhibition is full of extraordinary New Zealander stories. You’ll then hop back on the coach for a city tour of Wellington, before a free evening for you to spend as you wish. Hotel: Ibis Wellington - Breakfast included. Whilst travelling to Lake Taupo, you’ll pass a plethora of stunning sights, including Mt Ruapehu and Mt Tongariro. Visit the remarkable Huka Falls before travelling along the Thermal Explorer Highway all the way to the geothermal phenomena of Rotorua. Hotel: Sudima Hotel Lake Rotorua - Breakfast and dinner included. Start New Year’s Eve in style with a gondola ride and breakfast at the Skyline Rotorua – there’ll even be time for a luge ride. Next you’ll visit Agrodome for a great hour of farming entertainment, before journeying to Te Puia to see the impressive boiling mud pools and geysers that makes Rotorua so well-known. The afternoon will be free for you to enjoy at your own time, and in the evening you will regroup for a Maori Hangi and concert to see in the New Year. 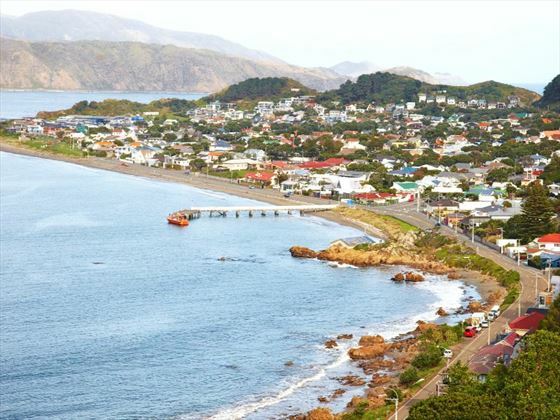 In the morning you will leave Rotorua and travel to Auckland, before taking the road via Whangarei to Paihia, a small town in the heart of the Bay of Islands. Your introduction to this beautiful destination is a visit to the location of the signing of the treaty between the Moari tribes and the British. Hotel: Kingsgate Hotel Autolodge - Breakfast and dinner included. 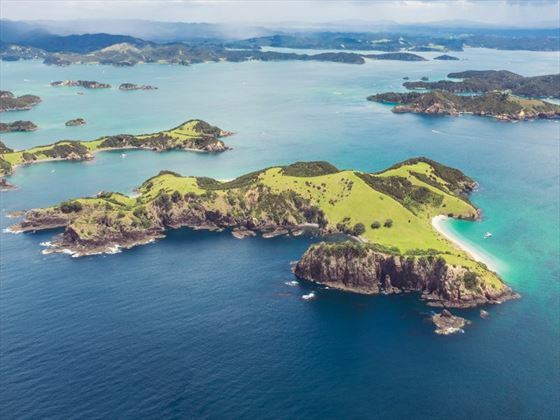 Today you’ll have the wonderful opportunity to cruise through the Bay of Islands on a luxury catamaran, sailing to Cape Brett and the famous Hole in the Rock whilst looking out for bottlenose and common dolphin along the way. Leave the Bay of Islands and venture to Matakohe for an educational talk at the Kauri Museum, before arriving in Auckland for a city sightseeing tour. In the evening, you will get together with your new-found friends for a farewell dinner. 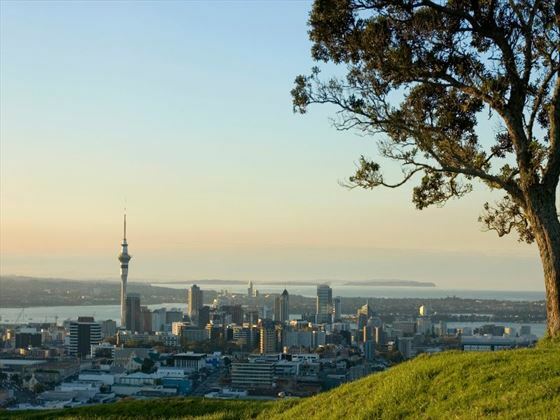 Hotel: Rydges Auckland - Breakfast and dinner included. Today marks the end of your tour. Transfer to the airport for your onward flight. Pre-paid activities: Christchurch Tram, Haggis Ceremony and gift, Larnarch Castle, Milford Sound cruise and lunch, cruise on TSS Earnslaw, Lakes District Museum, TranzAlpine rail journey, Interislander Ferry cruise, Te Papa visit, Skyline Rotorua Gondola and luge ride, Agrodome, Rotorua thermal mud pools and geysers, traditional Maori Hangi and concert, dolphin/Hole in the Rock cruise, Kauri museum, city sights tours of Christchurch, Dunedin, Wellington and Auckland.